Poland's right-wing leaders hinted Saturday they will not fully implement the European Union's new copyright reform, saying it stifles freedom of speech. Ruling party leader Jaroslaw Kaczynski said Saturday that a copyright directive adopted by EU lawmakers this week threatens freedom. The bloc's 28 nations have some two years to incorporate it into their legal systems. Without elaborating, Kaczynski said the Law and Justice party will implement it "in a way that will preserve freedom." 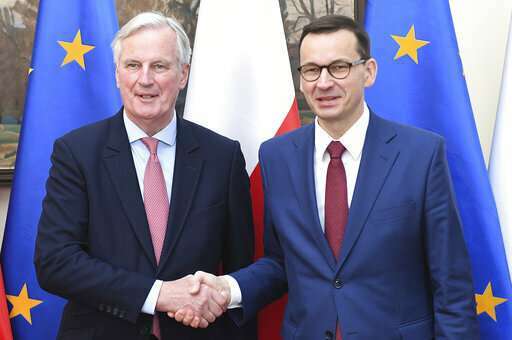 His words at the euroskeptic party's campaign convention ahead of the European Parliament election in Poland on May 26 were apparently aimed at attracting young voters, and countering an opinion that the conservative, nationalist party's policies are curbing free speech and ideas. The Law and Justice party earned this reputation by taking control of Poland's judiciary and public media, which put it at odds with EU leaders. But its policy of increased family benefits has been very popular in Poland. Polish Prime Minister Mateusz Morawiecki promised the convention "we will fight for the freedom of speech on the internet, to us it is a necessary element of economic freedom."